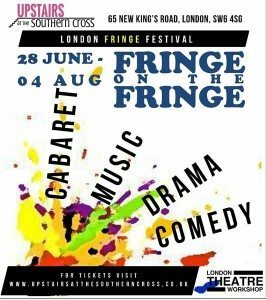 The London Fringe scene is one of the most creative and vibrant in the world. Whilst the number of venues continues to climb, often in unusual and unassuming places, you really get the sense that the fringe is where some of the most creative work actually lies. 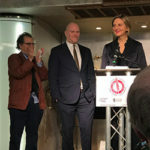 Upstairs at the Southern Cross is a brand new performance space, based in the heart of Fulham, directly in between Fulham Broadway and Parsons Green tube stations. With excellent transport links, a beautiful surrounding area and a real community feel, it is no surprise that owners Sarah Shelton and Ray Rackham have jumped upon this as an exciting new challenge. What began as an unused function room above a very traditional looking pub has become a fully serviceable cabaret space, seating around 60 audience members. With plans underway to develop this into a fully functioning theatre space, there are certainly exciting times ahead for this impressive new venue. Not only does the Artistic Director want to create an exciting blend of high-quality performances, but also use the space to hold workshops for the community, building strong relationships with the local area. The venue opened with an impressive line up of diverse acts, all under the banner ‘Fringe on the Fringe’, which plays throughout July and early August. Interest from companies wanting to use the space, many between the Brighton and Edinburgh Fringe Festivals, was an early indicator of the venue’s success, and performance slots were soon booked up creating an excitingly diverse programme. Shows range from small comedy acts to live music, musical theatre cabarets and even original plays. 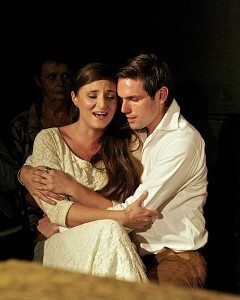 Just Another Love Story is the creation of Upstairs at the Southern Cross’s Artistic Director Ray Rackham, who has presented the piece on numerous occasions over the past eighteen months. After winning the Angel Award at the Brighton Fringe Festival in 2012, the Sondheim revue fits perfectly into the programming at the Southern Cross. The piece is an exploration of love, using the impressive catalogue of American composer Stephen Sondheim, whose work spans decades and multiple different genres. The title of the show comes from his 1991 work Passion which acts as suitable thread in which three different couples are woven together. Whilst there is no narrative per say, each character explores their relationship with another individual through comedic, upbeat and more heartfelt songs. It is easy to get lost in the beautiful score (realised expertly by arranger and Musical Director David Keefe) as one song blends into the next, and the careful ordering of tone and characters makes the witty word play of humorous songs such as ‘Can That Boy Foxtrot’ and ‘The Boy From’ align next to the more heartfelt ‘I Wish I Could Forget You’ and ‘We Do Not Belong Together’. Rackham and Keefe select with the wisdom, knowledge and experience of true Sondheim experts, and rather than be treated to an evening of predictable pieces from the most well known shows, there is true beauty in the programme which includes many lost gems and reinventions of classics. The cast continues to evolve from each incarnation, and now feels at its strongest. A mix of ages, voice and casting type makes for an interesting mix and blend, with each singer delivering songs within their specific comfort zone. Sam Harrison’s effortlessly beautiful voice carries off some of the larger numbers such as ‘Something’s Coming’ and ‘Being Alive’ and he sings with such honesty and conviction that you can’t help but want to hear more of him. He is complimented by John-Jo Flynn, who offers a contrasting, yet equally impressive vocal delivery of Sondheim’s more mature numbers, with a charismatic presence and winning smile. The girls are equally as impressive, from the stunningly beautiful Lowri Ann Davis who shows a diverse range of characterisation upon which a lot of the show rests, to the equally engaging Nova Skipp who shows off her incredible range in numbers as diverse as ‘Sooner of Later’ (made famous my Madonna, no less) to the haunting ‘One More Kiss’. The company sound of the hugely talent cast is empowering, and uplifting. This is a beautiful show that is accessible on many levels, from those new to Sondheim and those who live, eat and breathe him. There’s something quite appealing about seeing one of your favourite films turned into a musical, especially when it is free from the bells and whistles of the commercial West End. 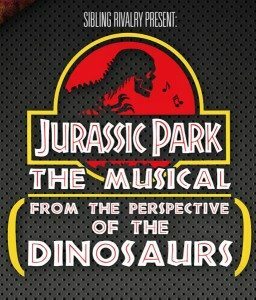 Jurassic Park – the Musical! offers a genuine musical comedy based on everyone’s favourite 90s movie in which a theme park made up of reincarnated dinosaurs goes slightly array, proving that even scientists cannot outsmart these extinct beasts with brains the size of peanuts. The musical is written and composed by Patrick and Jessica Rufey, who also provide the script and direction for the show. They manage to strike the correct tone, somewhere between absurd parody and over-the-top humour to make the piece work and keep it from becoming a personal indulgence or inside joke. Closely following the plot of the film, the six talented actors told the story from the perspective of the Dinosaurs themselves, with the clever aid of minimal props, set and costumes. The production was fast paced, frantic and thoroughly engaging, with the disorganised nature adding to the overall comic effect. Each actor played a range of characters, including all the famous faces from the film. Greg Airey stands out among the male cast as a fine comic actor, displaying an impressive comic range as well as a solid singing voice. Luke Coldham is a natural comedian, making John Hammond (among many other characters) come alive, driving much of the chemistry between the group. His vocal numbers are the most memorable, and he judges the audience well as not to appear too over the top. The female cast are equally diverse, playing a range of characters, but it is Carrie Marx who stands out as Dr Ellie who really catches the eye. The score was tuneful and witty, and despite being pre-recorded, managed to maintain the atmosphere. You were left wanting more music however, as some songs were underdeveloped, and it would have been nice to indulge further with numbers such as the ‘patter song’ which was one of the comic highlights. The show is high energy, sharp and executed with utter conviction. 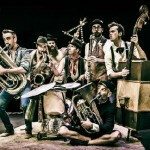 The company’s ability to turn up and perform almost anywhere is impressive, and the added characteristics of the venue just added to the co-ordinated mayhem the piece needs. This would be a perfect Edinburgh Fringe show, and one which guarantees a great night out. Die hard fans of the film will appreciate the intelligent references throughout and will be blown away by the conviction the cast gives to the piece. Jurassic Park the Musical plays at the Canal Cafe Theatre, September 19th-21st 2013 – well worth a visit! Actress Hannah Levane has racked up an impressive list of West End of Fringe credits despite only recently graduating from drama school. She was recently seen in the Union Theatre’s production of Bare in which her vocal talents attracted much critical attention. She has featured in West End shows such as Porgy and Bess and We Will Rock You as well as understudying the lead role of Delores in the first National tour of Sister Act. In her first solo cabaret Levane demonstrated exactly why she is so engaging to watch by performing a mix of songs that have all meant something to her at some stage in her life. Her voice is powerful, yet remarkably subtle, and she managed to demonstrate a diverse range of music each showcasing her unique vocal talents. Beginning the show with some solid jazz standards, she felt most comfortable delivering these original versions of classics such as Gershwin’s ‘Summertime’, from the show that gave her her first West End break after training. Levane was clearly comfortable onstage, in front of an audience made up of friends, family and fans. She talked openly to the audience and was able to tell her story, make jokes and draw everyone in with her effervescent personality. One particularly impressive number showed off her vocal diversity, as she mixed her ‘legit’ sound with her weightier soulful and gospel voice, showing just how talented, and cast-able she really is. My personal favourite was her performance of Stephen Sondheim’s ‘On the Steps of the Palace’ from Into the Woods which not only demonstrated her impressive intonation but her ability to clearly tell a story. Although this was the first solo outing for Levane, we are confident that this won’t be her last. We’re looking forward to see her career grow, and feel privileged to have been at her first intimate cabaret. Certainly a star of the future.